*Third party sensors, although technically compatible, have not been tested or verified by Wahoo Fitness and the accuracy of the data produced may not be as precise as those of Wahoo Fitness sensors. This product is designed for use with 30 pin iOS devices i.e. iPhone 3, 3GS, 4, 4s, iPad (1st-3rd gen), and iPod touch. NOTE: Newer devices i.e. iPhone 4s and newer, iPad 3rd gen and newer, iPad mini, iPad Air, and iPod 5th gen require a 30 pin to lightning adapter prior to use in order to be compatible. The Wahoo KICKR is compatible or adaptable with almost all bike styles and types. Exclusions may include various single speed bikes, track bikes, recumbent bikes and through-axle bikes (12x142mm through-axles can be adapted, other sizes cannot). Contact Support ifyou’re not sure if your bike is compatible or able to be adapted. This setup guide is intended to assist with pairing your sensor to the Wahoo Fitness app via the Wahoo Key. Insert the Wahoo Key securely into the 30 pin connector at the bottom of your device. Wake up the sensor you wish to have the Wahoo Key pair with the Wahoo Fitness app. Make sure the sensor is within 5’ (1.5m) of the Wahoo Key. Your sensor is now set up and ready for action. To use your sensor, start a workout with one of the profiles you paired it with. The Wahoo Fitness app will remember this pairing in the future. You simply need to wake up your sensor and start a new workout to begin recording data! NOTE: You will need a 30 pin to lightning adapter if using on newer iOS devices not equipped with the 30 pin port. Sensors connecting via ANT+ will have a ANT+ icon displayed next to the device type. For more information: Please refer to the instructions page for the Wahoo Fitness app or the Wahoo sensor device you are using with the Wahoo Key. Each App connects to sensors a little differently. Open the compatible App you'd like to use and find the settings. Look for "connect to sensor" or another similar option. You must connect each sensor separately for each App you use. Dust, lint or other debris may collect in the 30 pin connector & is the most common cause for issues with the Wahoo Key. Canned air or a flat style toothpick may be used with care to clean the 30 pin connector. Download the Wahoo Fitness Utility App from the App Store. Insert the Wahoo Key securely into the 30 pin connector at bottom of iOS device. Open the Wahoo Fitness Utility App. Select the sensor you would like to pair with the iOS device. Make sure the sensor is within 5' (1.5m) of the Wahoo Key. Since most ANT+ sensors 'sleep' when not in use, you may have to 'awaken' it- for example, a stride sensor can be activated by taking a few steps. The Wahoo Utility should now connect to your sensor & display information regarding sensor data, signal strength and serial number to confirm connectivity. 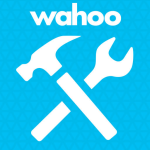 Close the Wahoo Utility app to disconnect the test pairing. Try using the Wahoo Key with a different iOS device to make sure the device itself is not the issue.